It has been my honor to practice orthodontics in the Aiken area for the past 15 years. I strive to create a positive experience for my patients, making them feel comfortable and welcome. I feel that orthodontics is a great way to challenge myself while making a difference in another person’s life. I love seeing the joy that each transformation brings to my patients and the boost of confidence they get from their new smiles. I regularly attend continuing education meetings and courses that keep me abreast of the latest developments in technology and orthodontic care. They allow me to keep up with state-of-the-art techniques in orthodontics which, in turn, allow me to create a better patient experience. I have lived in Aiken my entire life, and am proud to call it my home. 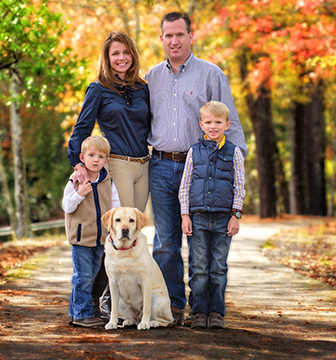 My wife Vicky and I have two young boys, Jack and Lagree, and Annie, our yellow lab. I am an avid sportsman, enjoying fishing and hunting, as well as a big fan of University of South Carolina sporting events. In addition to being involved in local and state dental societies, I attend many church functions and volunteer my time with Give Kids a Smile and at local school dental screenings.